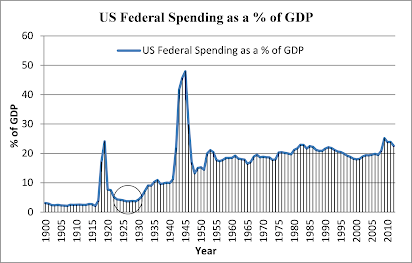 Below is a graph of US federal government spending as a percentage of GDP. The data is taken from Usgovernmentspending.com. What is interesting here is how low the percentage was in the 1920s when the Great Depression struck in 1929. Herbert Stein notes that total US federal government spending in 1929 was about 2.5% of GDP (Stein 1966). But the rise in US federal government spending as a percentage of GDP in 1929 to 1933 was partly the result of the collapse in GDP, and not huge increases in government spending relative to GDP. Given that US GDP collapsed by 28.52% between 1929 to 1933, the rise in US spending under Hoover was feeble and far short of what was need to stabilise GDP and end the depression. In fact, Hoover actually ran a budget surplus in fiscal year 1930 (from July 1, 1929–June 30, 1930), not a deficit. Hoover also cut spending in fiscal year 1933, and introduced the Revenue Act of 1932 (June 6) which increased taxes across the board and applied to fiscal year 1932 and subsequent years. These were all contractionary fiscal policies, and the rise in government spending as covered by tax increases was not stimulative. If we want to see the kind of government spending that creates relative macroeconomic stability, then we need to look after 1945. The macroeconomic stability that emerged after 1945 in the US (and other nations) is a strong function of the much larger role government spending has in the economy, of the more effective use of fiscal policy, and, of course, central bank interventions. 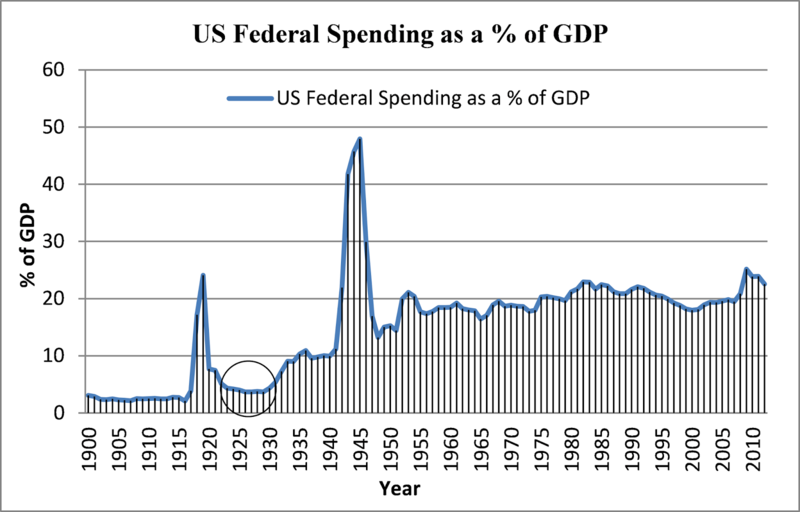 As we can see, US federal government spending as a percentage of GDP has fluctuated around 20% since 1945. It has risen since 2008 because of the US stimulus and the unprecedented crisis not seen since the 1930s. But today government spending and financial sector stabilisation via central banks was enough to prevent a return to 1930s-style depression. Great analysis as usual LK. Beckworth: "This figure is striking. It shows that in 2013 the sharpest change in fiscal austerity was in the United States. Now let us put this all together. The Fed QE3 program was pitted against the sharpest change in fiscal austerity across the largest advanced economies. Many observers predicted this fiscal austerity would lead to a recession. Other predicted it might costs as many as 700,000 jobs. Market monetarists like Scott Sumner and myself were more optimistic. So how did this natural experiment turn out in 2013? Not all the number are in, but what we do know is that economy did better than expected and outpaced 2012." From the Post Keynesian perspective, such forecasts that were made cannot predict future specific GDP quantities with objective probability, and we face degrees of uncertainty about the future. So some Keynesian forecasts were wrong and the economy did better than some thought. But this is hardly the big deal the monetarists make it out to be: Keynesians accept that the private sector can provide unexpected growth. However, there are mountains of evidence that in 2008-2009, many nations, the US included, engaged in stimulus packages that ended their recessions and averted actual depressions. Those nations that did not provide stimulus — such as Ireland, the Baltic states, and Greece — suffered severe depressions comparable to those of the 1930s. "These were all contractionary fiscal policies, and the rise in government spending as covered by tax increases was not stimulative." Really? Why would you say that? Ronald Reagan taught us that taxing the rich less *while continuing to spend the same percent of GDP* actually slows the economy even though you should have more physical dollars in it.